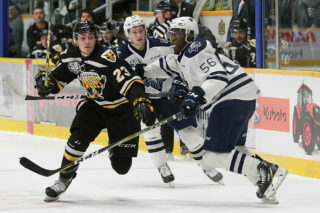 The Screaming Eagles season came to an end on Friday night in a 5-3 loss to the Rimouski Océanic. 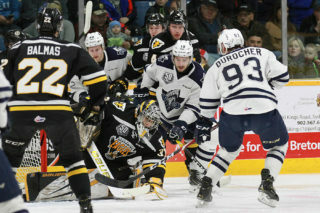 With the victory Rimouski wrapped up a 4-1 victory in the quarter-final QMJHL playoff series. Rimouski carried the opening period on the shot clock, outshooting the Eagles 16-5, but the teams would trade leads on multiple occasions. Jimmy Huntington opened the scoring 2:26 into the contest, converting a cross-ice pass from Alexis Lafrenière and tapping in the game’s opening goal. The opening goal came in the midst of three straight power plays for the home side. The third time was the charm as Mitchell Balmas hammered a rocket of a shot over Colten Ellis to tie the contest. Just past the halfway mark, the home team would take the lead. After Ellis denied Brooklyn Kalmikov at the side of the net, Félix Lafrance would wrap the puck around the net into an empty goal. There was one more twist before period’s end though. Olivier Garneau tipped a Jordan Lepage shot by Kevin Mandolese and the series was tied at 2. It was the first game of the series for Lepage, who was returning from injury. There was only goal in the second period, and it went the way of the visitors. After denying Olivier Garneau on a breakaway and Alexis Lafrenière on a subsequent rebound, Kevin Mandolese was beaten on a breakaway by Anthony Gagnon. It was a 3-2 advantage for Rimouski going into the final 20 minutes. Cape Breton didn’t take long tying the game in the third period- Derek Gentile found the tying goal 67 seconds into the final frame. Unfortunately for the home side, it was the final time the Eagles would score during the 2018-19 season. Before the five minute mark, Radim Salda would fire a rising shot over the shoulder of Mandolese and it was 4-3. The Eagles outshot the Océanic 12-3 in the third period and are given a key opportunity when Lepage was sent off for tripping with just over five minutes left. 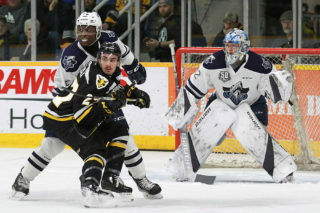 The Eagles were unable to find the tying goal, but would again play with a man up when coach Marc-André Dumont elected to lift Mandolese for an extra attacker. There would be chances, but ultimately it was Garneau that would find the back of the empty net and Rimouski salted away a 5-3 victory. Mandolese topped 30 of 34 shots in the loss, in addition to the empty netter, while Ellis stopped 21 of 24 shots. 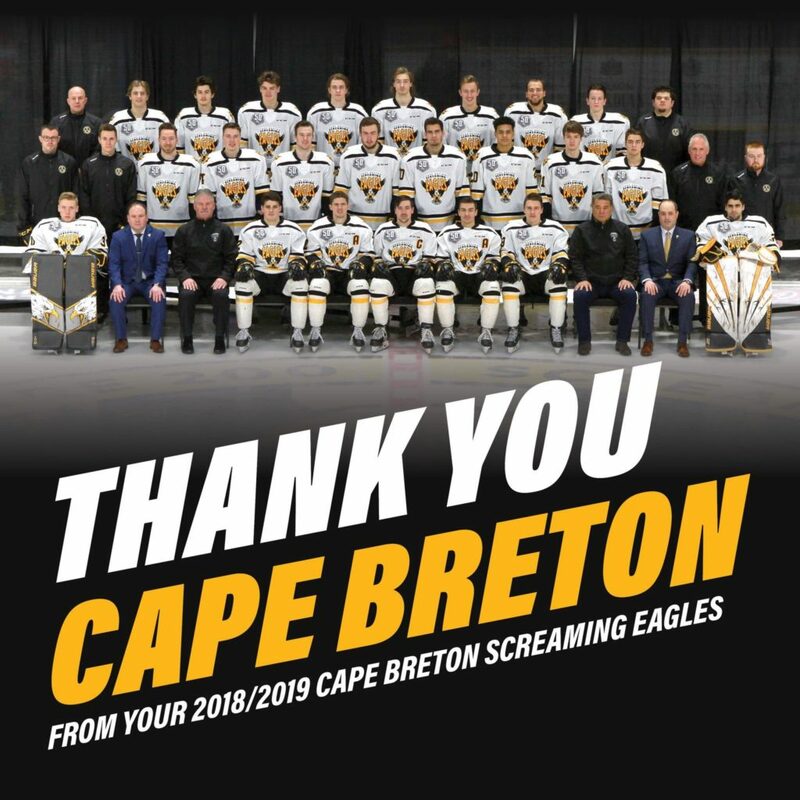 With the loss comes the end of the season and the end of the career of the Screaming Eagles three 20 year olds- Mitchell Balmas, Declan Smith, and Wilson Forest. Smith was unable to play in the final three games of the series, sidelined by an upper body injury. The Screaming Eagles will now look ahead to the QMJHL’s annual draft in Québec City on June 6th, 2019. Stay tuned to capebretoneagles.com and Screaming Eagles social media for further updates throughout the off-season. Go Eagles Go!